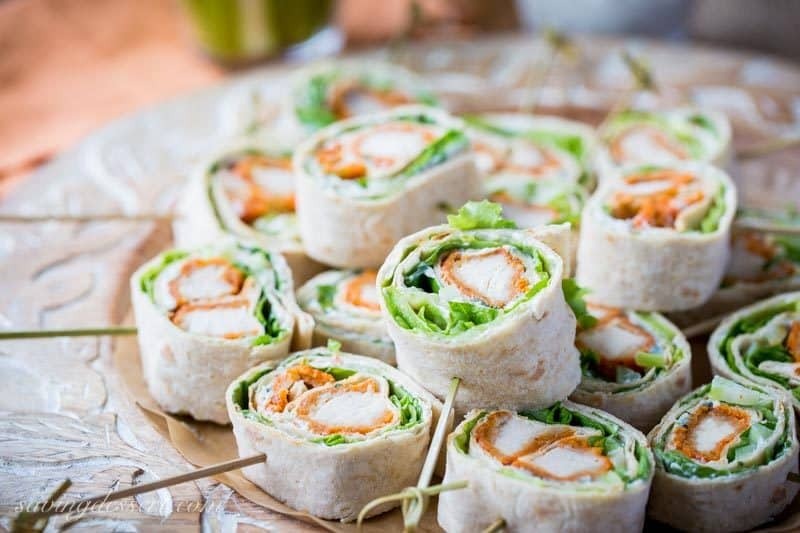 Easy peasy ~ Buffalo Chicken Roll Up Appetizers ~ made with all-natural frozen breaded chicken tenders tossed in hot sauce, then rolled up with a homemade blue cheese dip, diced celery, and crisp lettuce. Not a big fan of blue cheese? No worries – they’re great with ranch dressing and shredded cheddar too! 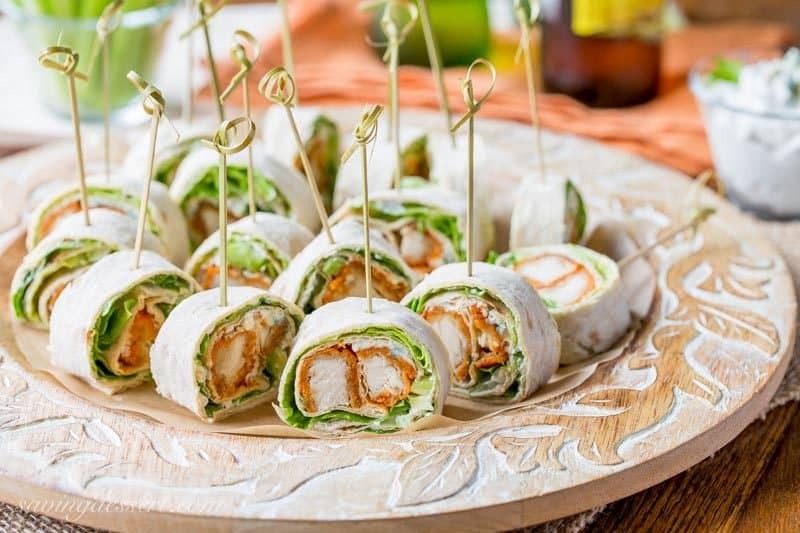 Whether you’re getting ready for the “big game” or a simple, light dinner, these Buffalo Chicken Roll Up Appetizers will sure to please! We’re big fans of spicy, rich flavors but not so much for the bar scene where you get those wonderful deep fried wings. This appetizer satisfies that craving and then some! 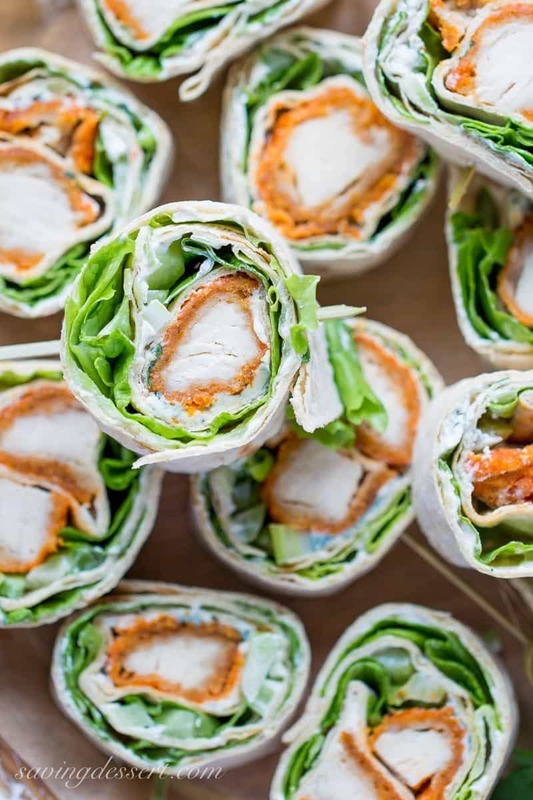 We’ve really gotten into wraps this past year, especially with our favorite Lavash sandwich roll-up flatbreads made with flax, oat bran and whole wheat flour. They’re lower in carbs than most breads so that’s a bonus! 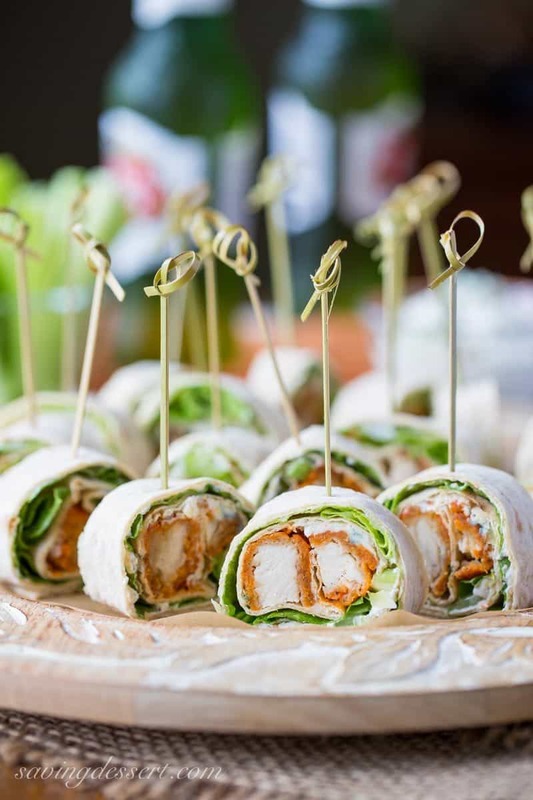 We’ve made Buffalo Chicken Roll Ups with baked chicken too – but really love the way the sauce clings to these breaded tenders. I’m also the number one fan of make-ahead appetizers so I don’t have to spend game-time in the kitchen when everybody else is hooting and hollering in front of the tv. Chicken tenders are baked then tossed in hot sauce while still warm from the oven. Once cooled, they are tossed in the sauce again then rolled up in the flatbread. At this point you can refrigerate the appetizers until time to serve. This is one of those recipe ideas that’s highly adaptable to your tastes. We love blue cheese (well … any cheese really) so I made a simple blue cheese dip for smearing on the flatbreads and used the extra as a dip for celery sticks. We’ve tested these with a good thick ranch dressing and shredded cheddar with great success. The key is to have your chicken well coated in the hot sauce so that’s where these breaded tenders come in handy. They soak up the hot sauce so the roll up is not dripping in dressings. Be generous when spreading the blue cheese dip on the flatbread. It helps hold everything together and adds that amazing bite we all love in a good Buffalo Chicken appetizer. Made with all-natural frozen breaded chicken tenders tossed in hot sauce, then rolled up with a homemade blue cheese dip, diced celery, and crisp lettuce. In a small bowl combine the cream cheese, sour cream, 2 ounces of the blue cheese (crumbled), pepper, salt and parsley. Stir to combine, cover and refrigerate until ready to use. Preheat oven to bake the chicken tenders / strips / breasts. Bake the chicken strips according to the package directions. While hot place the chicken strips, two at a time, in a bowl and toss with the hot sauce. Repeat until all the chicken strips are coated. Place on the baking sheet in a single layer to cool. Once cooled, toss in the hot sauce again and set aside. 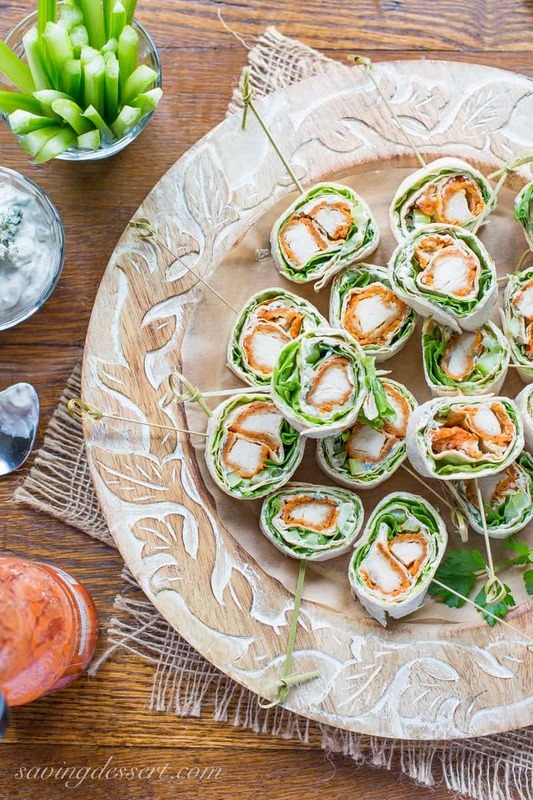 To assemble the roll ups, spread each flatbread with a generous amount of the blue cheese dip. At one of the short ends of the flatbread, place two chicken strips, then next to the chicken, sprinkle with the diced celery, then add the lettuce. Add more crumbled blue cheese if desired. Roll up the flatbreads and cut into 6 to 8 pieces each. Secure the roll up with an appetizer pick. These are best served within an hour or two of assembly. Substitue ranch dressing and shredded cheddar cheese if desired - or do half ranch and half blue cheese to make everyone happy! I think I could eat half of that try myself 🙂 They look positively delicious, Tricia, and I’m a big fan of blue cheese (even Stilton – shhh). So pretty to look at too! I do like a pretty appetizer 🙂 And I love blue cheese. Almost any cheese, really. Thanks Amalia – I love all cheese varieties too. It adds so much to this appetizer. Great to hear from you! Thanks Gingi – I bet they are going to love it! Have a terrific week. I wish we were snacking on these delicious treats instead of the yucky sushi I picked up, lol. Haha – I know the feeling Robyn – It is a busy life!~ I hope your favorite team is still in it 🙂 We don’t have a favorite this year – but I am glad Dallas is out. They’ve won enough! Haha. Have a great week! Perfect for a game day buffet!! Love this combination of flavors and know they’d fly off the table! I’m with you Tricia! Anything we can make ahead is always best! I can imagine the crunchiness in every bite! – these little guys look fabulous! great job! Hi Tricia, these look utterly scrumptious, wondering what brand of frozen chicken tenders you buy, will be making next week-end! Hi Cheri – I used Perdue chicken breasts / tenders. Hope you have them there – as they are pretty good! I also put that info in the notes section of the recipe 🙂 Enjoy! Thanks Tricia, sorry I missed that. Perfect for game day or for a crowd! I love anything I can make ahead and these look terrific. I know I have to make buffalo wings already for the Super Bowl…the fellas love all things buffalo chicken. I’m sure this would be a big hit. Enjoy the weekend! Easy appetizer to serve when having friends over to watch the football playoffs. Guys do love their football food – have a terrific weekend Karen and thanks! Great creation Tricia – sure they would be a big hit. Thanks Larry – have a great weekend. And, for the first time in many, many years I am loving football again! Thanks to Dak Prescott! Ha! Thank you for this recipe. Tricia! A fantastic idea! That dip sounds particularly yummy. The dip is great for blue cheese lovers Angie – thanks! Happy Friday. Combining the soft cheese spread with the crunchy chicken makes this a delicious appetizer and you probably have to make some extras . I love to have one right now. Thanks Gerlinde – wish I could share them with you. Have a super weekend! I’m quite certain these would fly off of any appetizer tray. They’re beautiful and sound delish! Thanks Chris – love that hot sauce flavor on just about anything – but it is especially great on these chicken tenders. Have a lovely weekend! You are brilliant ~ the crunchy fried chicken just makes these! I can imagine biting into one and getting all those wonderful textures together, I definitely need to try these. Thanks Jennifer – and thanks for the inspiration for using frozen chicken tenders! Love your chicken and waffles recipe. Have a lovely weekend!